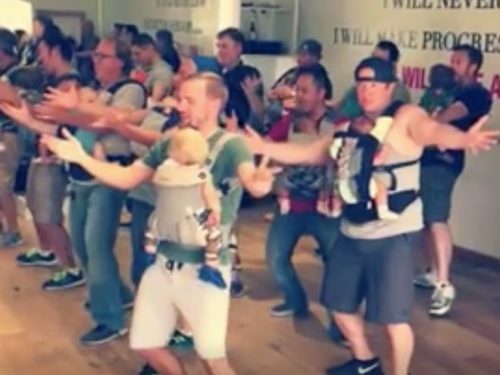 Get your grin back, with a dose of dancing daddies and their bouncing babies! Fathers were invited by GroovaRoo Dance to perform a choreographed number to the tune of Wild Cherry’s “Play That Funky Music” during what’s called a “Mommy Mingle, Daddy Dance” class. As one mom boasted, the proud papas “were dancin’ and singin’ and movin’ to groove” to show their baby mamas how much they appreciate them. She shared the California children’s dance studio video of their cheerful performance on Facebook. Watch the result below, and be prepared for happiness.